First of all, I'd like to welcome you back to the 09-10 school year. I know the staff members at ESU 4 wish you a successful year as you strive to improve student learning. There are many changes the school year brings, especially in the area of technology. I am always grateful for the opportunities I get to learn new technology tools. I was fortunate to attend the NECC (National Educational Technology Association Conference) in Washington, D.C. this summer. I went to many sessions, but speciﬁcally, I wanted information on how iPods are used in the classroom. Here is an article I submitted to be printed in the next NETA newsletter. I hope you ﬁnd it helpful if you want to use iPods in your classroom. Imagine a classroom where a student walks in, grabs an iPod touch, and takes a pre-class survey, then moves on to an interactive lesson, then ﬁnally does some practice questions and a post-survey, all from an iPod. While at NECC 2009 in Washington, D.C. I chose sessions that dealt with using smartphones and iPods in the classroom. One session in particular I went to was a model lesson using iPod Touches in the classroom and what was described above actually happened in that session. It was very interesting, and the presenters did a great job of answering questions. They were in a pilot year and had found many ways to incorporate iPods into their school. This particular school received a grant from AT&T to purchase 70 iPods. The iPods allow for universal design, and they were amazed at the increase in student motivation. The presenters stressed that they were focusing primarily on increasing math scores in their K-5 classrooms. The participants were given an iPod and a log sheet when they walked into the classroom. Then they performed a short lesson on adding fractions and kept track of applications they used on the log sheets. The participants were able to learn at their own pace by pausing, stopping, and/or replaying the content on the iPod. They were to record their data on their log and then go on to the next application. If they ﬁnished the lesson early, they were able to play any applications they wanted until instructed to quit. 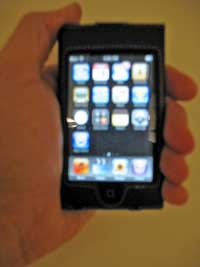 For security reasons, some settings, such as Internet connectivity on the iPod can be disabled so students do not have access. This session piqued my interest as I believe there are many classrooms that can beneﬁt by using handhelds. But, what about charging and syncing? If you are familiar with iPods, then you understand that you can only sync on iPod to one account at a time. Take into consideration TriBeam. It allows you to charge and sync multiple iPods to one account at a time. In this session, they demonstrated that they can charge and sync up to 15 iPods at a time. Other sessions I went to included the same idea - using handhelds (smartphones, iPods, etc) in the classroom. I believe that is where 1:1 learning can start to take place in more schools where budgets are tight. Handhelds have gained popularity in recent years and already have pre-built apps installed, such as calculators, calendar, and stopwatches. Some of them, including iPod Touches, have notes built-in that will sync back to your computer, provided you have the new 3.0 OS for your iPod Touch. Then, when youconsider all the free apps that Google has built, such as Goog411, Google SMS, and Google Maps (to name a few) there is a lot of teaching and learning that can be done with these small "computer-like" devices. For the iPod, many educational apps are free from the Apple store.